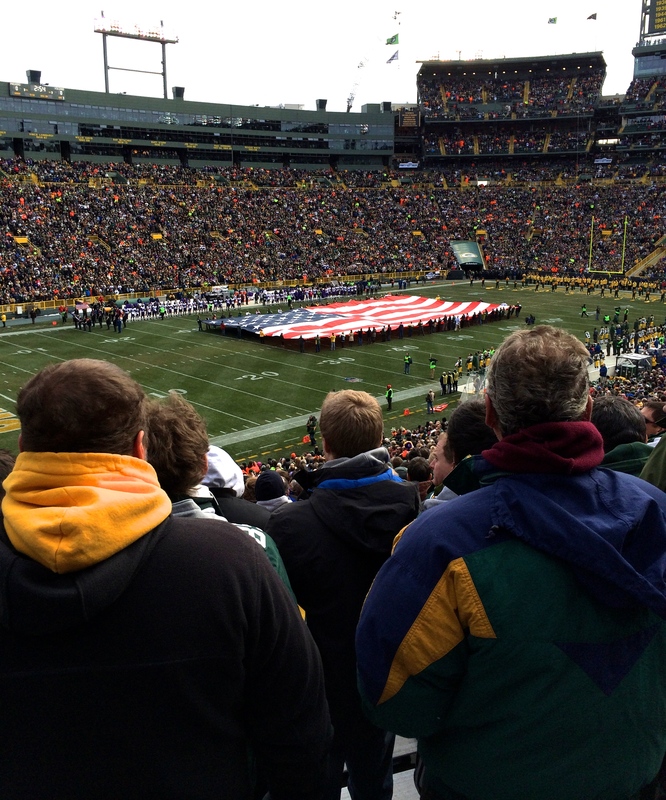 While still suffering from seasonal amnesia back in September, I won two tickets to a Packer football game. Seasonal amnesia happens after you escape death-by-cold in northeast Wisconsin and convince yourself that the unseasonably warm fall weather will sneak unscathed through the months of winter, arriving just in time for spring. You convince yourself that bones can’t freeze and teeth cannot grow noticeably shorter from chattering. You should know better. Cold is frozen into first place in my list of things I hate. I prefer sweltering to sweatering so many layers I cannot bend my arms. I do everything I can to avoid cold and would never willingly put myself in a place where frost is free to bite at will. And yet…few things please me more than free. I rarely pass the sample ladies in the supermarket, and when I shop, I look for bargains. The ultimate bargain, of course, is free. Bewitched by the weather and the win, I told my husband I wanted to attend the game at Lambeau field. 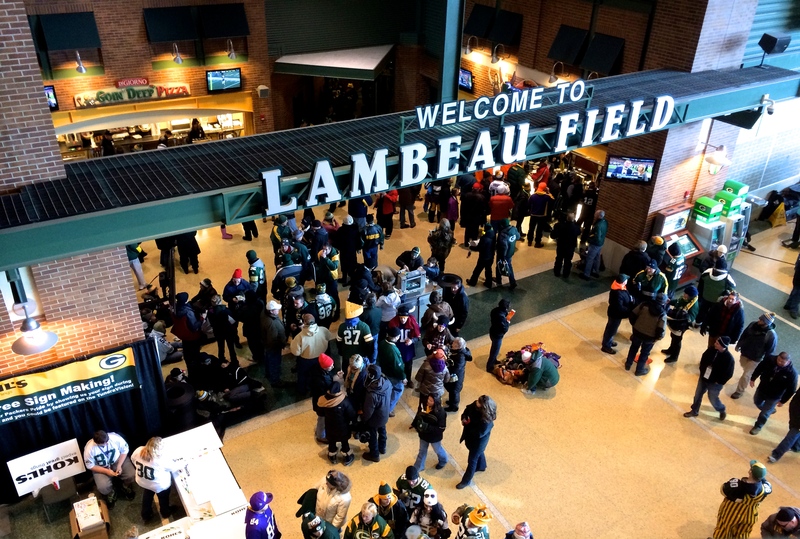 If you have ever been to Green Bay, Wisconsin and visited Lambeau, you know that for a pro football stadium it lacks nothing, unless roofs are important to you. I am rather fond of them myself, especially when the colored alcohol in the thermometer refuses to rise above 23 degrees Fahrenheit (-5 degrees Celsius). And yet…I won a pair of FREE tickets. Me, lucky me. All those other people wanted those tickets, but did they win? No! I won! Somehow I convinced myself that free is stronger than cold. When I awoke from my enchantment, I discovered I was living in winter. I could have turned back, given the tickets away, and barricaded the door, but I convinced myself it would be an adventure – a free one. The morning of the day I was prepared to die, I laid out the clothes I would probably be buried in: two pairs of long johns, three pairs of socks, a long-sleeved pullover, a wool sweater, heavy pants, a wool scarf, a knit hat, silk glove liners, wool gloves, snow boots, and a hooded down coat. In my arms I carried a Packer-green throw and a queen-sized blanket. The sister-in-law who correctly diagnosed me as insane lives within a ten-minute walk from Lambeau stadium, so we parked at her house and walked. I felt invincible with my soft, wimpy flesh encased in sheep and geese products. I, the thin-blooded, slim-minded Texan, had tamed the mighty Wisconsin cold. That euphoria lasted the entire ten minutes it took to reach the mausoleum/stadium. Thankfully, the stadium has an atrium with walls and a roof, a concession no doubt to the non-natives who might be lured in by free tickets. Fearful that the mustard on my brat (the wurst kind) would freeze before we found our seats, we ate our lunch inside. With my belly full of brat and my mind full of hubris, we left the atrium and entered the roofless stadium. When we reached section 110, row 46, seats 20 and 21, I felt as if Christmas had come early. Santa Claus, or his near cousin, sat in seat 22, his own warm self overflowing into my 18 inches of space on our shared metal bench. When he saw me moving in his direction, he smiled with delight and said, “Are you sitting here?” Both of our prayers had been answered – he had asked for a small person on his left, and I had asked for a large one on my right. My husband brought a large cushion to sit on, while I brought a smaller one and the green throw to sit on. I snuggled into my now 12-inch seat, pulled the blanket over me, and waited for the games to begin. Once I was thoroughly nested, a bunch of people appeared on the field with a gigantic American flag and I had to stand up. That meant removing the large blanket, positioning myself between two large men on either side, checking to make sure my small blanket didn’t fall down when I stood up, and avoiding bumping into the people in the row in front as I tried to maneuver and actually see over their tall, fluffy bodies. The seatmate behind me, less inhibited than I, carried a large cardboard sign, which she waggled around, hitting me on the back numerous times. After the anthem, things began to happen. The other 79,999 people roared periodically, prizes were announced on the big screens towering over the stadium, music blared, rupturing eardrums at will, non-profits advertised, vendors vended (mostly beer), and people began excusing themselves up and down the long rows of swaddled people. My husband described it as a rock concert-church bazaar-bingo game atmosphere. In the meantime, some football players down on the field started crashing into one another. Half of the time, I couldn’t actually see what they were doing because the excited and quickly inebriated fans in row 44 liked to stand and watch, unaware that none of the people in rows 45 to 47 could see through them. So I watched a lot of the game on the big screens. This led me to ask myself two questions. First, why are football players smaller in real life? They looked like miniature versions of their television selves. Second, since I could see more of the game on the big screens in the stadium instead of squinting at the field, why was I sitting outside in 23-degree weather watching the game on their screens when I could be sitting in my chair at home watching the exact same thing on my TV screen? Note how small the football players actually are! I’ve always heard being on TV makes you look heavier, but I didn’t realize how much. After spending close to three hours sitting outside watching TV, it hit me like a block of ice that I had another two or three hours to go. That’s when I got cold feet. Literally. Well, actually I got cold toes. All ten of them asked to leave, and I, being both in the minority and a believer in democracy, yielded. We arrived home in time to watch the last quarter of the game, which went into overtime and ended in a tie. Because it’s winter and I recognize that winter’s death threats are serious, I’m sure I will never go to another Packer game in mid-November when the temperature has sunk to the twenties. 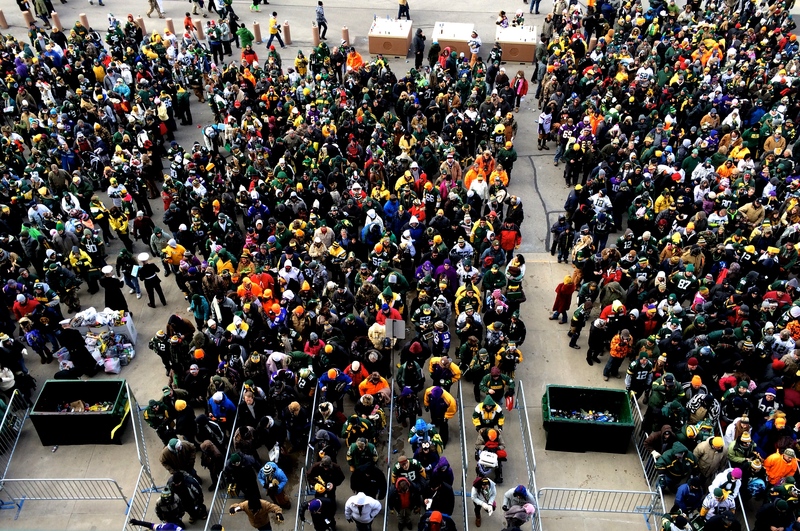 I am sure in the same way I was sure before last week that I would never go to a Packer game in winter. In the same way I was sure I would never live in Wisconsin because it’s too cold. My only fear is that I will win or be given free tickets again. So, I’ve written this post as a reminder. If I read it before football season each year, maybe I’ll get cold feet before I go. I did that once in Philadelphia when I was in my early 20s. It snowed. I froze. They don’t make clothes that can keep me warm when I am sitting and doing nothing. Never went to another game unless I could sit in a box. Since that is expensive we know how many games I have watched in person! I like the idea of sitting in a box to watch the game, but like you, I think it would severely limit the number of football games I would attend. A proud Green Bay tour guide directed our bus to the Packers stadium and raved with glee while we Texans circled the empty parking lot. Such loyalty. I think it’s a matter of pride not to have a roof. However, I will give up pride for warmth any day. I am shivering just thinking about it. Must remember, Must remember. Must remember. Yikes. I am so glad you survived and were able to be thawed out again after such an adventure. May I humbly suggest that you not only re-read this piece before you consider committing such folly again, but also that, if you are utterly determined to go to a winter football game ever again you only do so if allowed to *play* in the game. You might have a hope of staying ever so slightly warmer, running for your life from a herd of human bison in there, or if not, you can always let them hit you and then you’ll be hauled off to the nice cozy warm hospital. I’m worried that I will forget to re-read this post next winter. I admire your bravery. Watching a football match for hours in the cold is not something I would contemplate doing _ I am chilled to the marrow just thinking about it. How horrible it would have been for you if you’d stayed through overtime to watch a game nobody won. You picked a good game to leave early. It was hard enough getting free tickets and having Aaron Rogers out with an injury. They should make those “cheese heads” with ear muffs? I would have done the same thing…love freebies. Unlike you I much prefer the cold. It is SO difficult to get cool when it is 35degrees outside…hate being too hot. If I lived in constant heat I might grow tired of it, but I don’t think I will ever get the chance to find out. The best word to describe it is “spectacle.” The noise from the announcers, the big screens, the vendors yelling, the crowd roaring, people moving up and down the rows to go to the bathroom or get something to eat – all together evoke a visceral response and you definitely feel that you are part of something bigger than yourself. It’s easy to see how people get carried away by a group or mob. The antics of Row 44 reminded me of some concerts I have been to. If you win again, you could regift the tickets to a charity for a fund raiser. It’s amazing how many people have no spatial awareness of the people behind them. 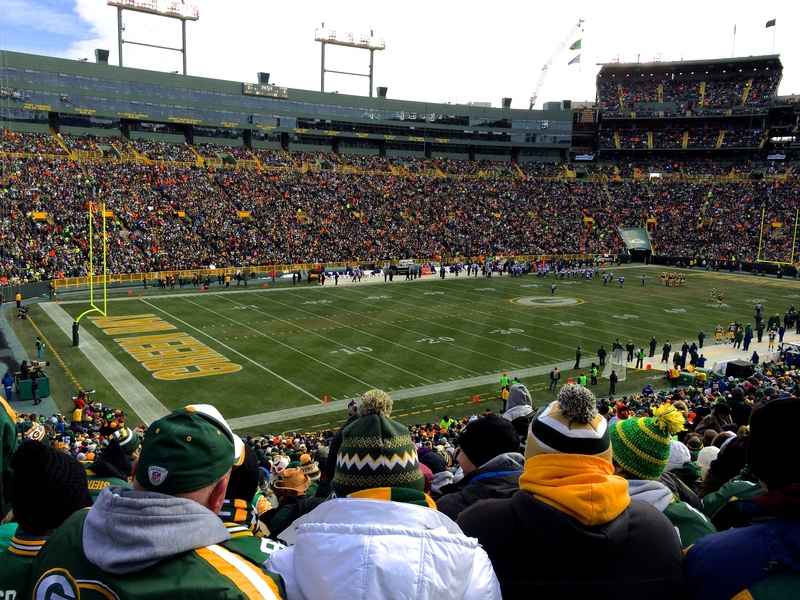 Good idea about the resifting – although knowing myself as I do, I imagine that I would end up once again on a cold bench in Lambeau field. Speculating from southern California here. Don’t people in cold places invest in electric socks, hand warmers, & such? Or are these useless gimmicks? Why no mention of putting the blanket around you AND your husband (another source of heat)? Hand warmers are helpful, and I had hoped to put some in my boots, but with three pairs on, I could barely get my feet in! If I had had larger boots and had brought cardboard to rest my feet on, rather than concrete, they may have stayed warm longer. The rest of my body was fine since I had ample layers and a heavy down-filled jacket with hood. It was just my feet that grew cold. Look at it this way…now you can take that off your bucket list! I will have to look into Sorel boots. Thanks for the tip. I would rather be warm than fashionable any day.